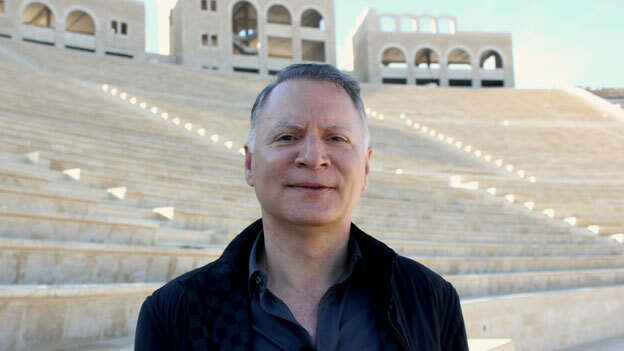 A Palestinian millionaire has built a totally new city from scratch in the Israeli-occupied West Bank, complete with a Roman amphitheatre and football stadium. But one thing is stopping people moving in – there’s no water. What about building in the midst of one of the world’s most intractable conflicts? 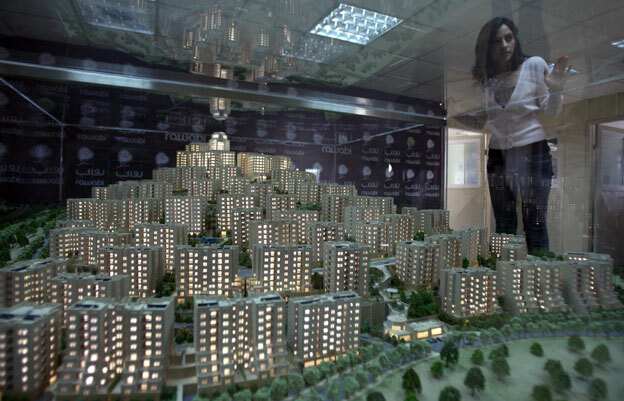 “It’s the biggest ever project in Palestinian history,” exclaims American-Palestinian multi-millionaire Bashar Masri, the driving force behind a new Palestinian city in the hills of the Israeli-occupied West Bank. “There’s nothing even close to this, not even half this,” Masri enthuses. We’re walking across what will be a grand Roman amphitheatre in the foothills of a jagged skyline of apartment blocks that, one day, 25,000 people may call home. There’s also the promise of cinemas and shops, parks and playing fields, to complete the kind of middle class dream you’d see in a property development anywhere. Palestinian critics accuse him of “normalising the occupation”, of making deals with Israel for private profit. Jewish settlers on nearby hills watch and worry as Rawabi rises from the ground. “I am defying the occupation,” insists the well-dressed and well-spoken Masri, who comes from an extended Palestinian family known for its financial success and political savvy. “I can just see everything, in my mind, complete,” Masri tells us on our first visit to Rawabi, in the spring of last year. A slim man in his fifties, he strides confidently across paving stones strewn with coils of wire and piles of stone. “I see people here in the restaurants, I see people in the homes…” His voice trails off as he gazes across the dusty terrain which now consumes most of his time and a lot of his money. Rawabi promises gardens, trees, and quiet. Their plans are taking shape – a Bedouin-themed corner in the living room; pink and blue shades in the children’s bedrooms. “It’s the first step to building a small model for a Palestinian state,” says Suhad. Masri leads us up an empty stairwell to inspect one of the finished showroom apartments. It’s light and contemporary, with gleaming kitchens complete with fridge magnets from Paris, as well as stylish sofas, and a whiff of scented candles. “We’re not promising people here heaven, we’re not promising anything less than we are still under occupation,” insists Masri. In the spring of 2014, we find Ateret residents suspicious, but already resigned to the new city’s existence. The Damris are softly spoken with a strong political message. “This state is our state. The Jewish nation needs a home so much. We need to always remember that it’s our land and we are the landlords,” explains Avigail as their young boys play games on the floor in their modest bungalow. Like Israel’s government, they reject the claim that settlements are illegal under international law. The Damris don’t believe that will happen any time soon but suspect Rawabi is an effort to move toward it. “We can’t let that happen,” says Chanan. 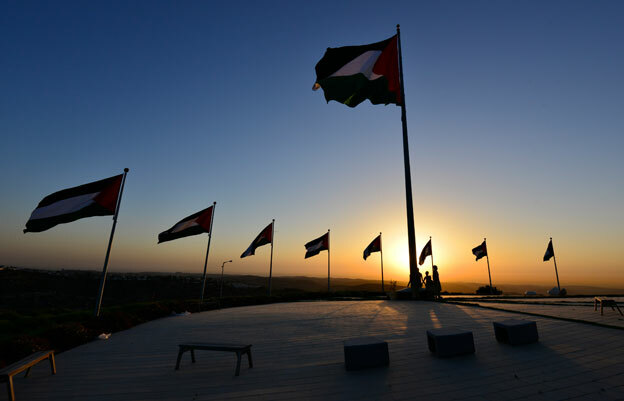 To build here, Masri has needed co-operation from Israeli officials every step of the way since plans first surfaced on paper seven years ago – even on where to build the city, and a temporary access road. 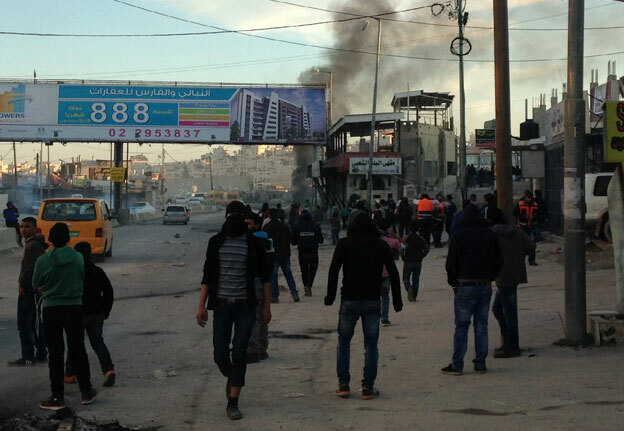 But a Palestinian activist we meet close to a nearby Israeli checkpoint, on a day when the death of a 21-year-old Palestinian has led to the eruption of clashes between soldiers and protesters, says Rawabi is “just a way for [Masri] to expand his wealth”. “That’s not resistance,” he adds. Masri’s critics also accuse him of building for a privileged elite. 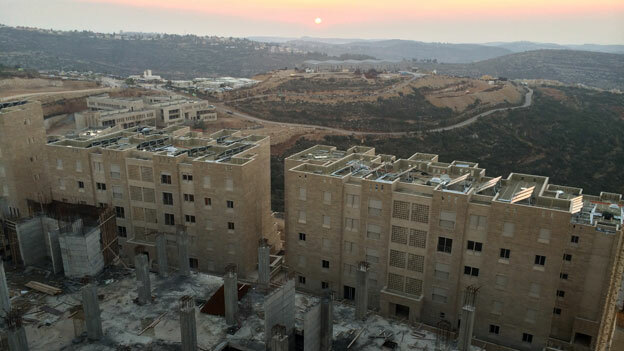 A typical apartment in Rawabi costs $95,000 (£62,000) which is cheaper than in Ramallah, but well above what many Palestinians can afford. 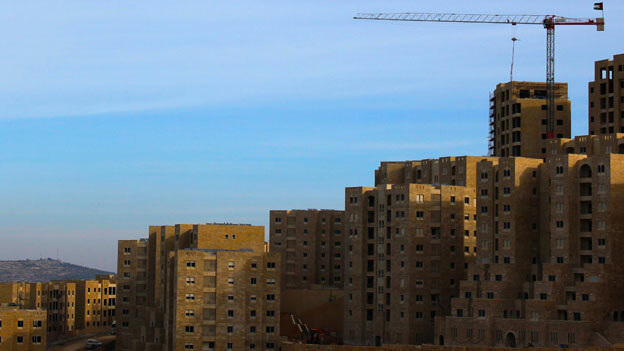 There’s also a chronic shortage of affordable housing in the West Bank. Masri insists Rawabi isn’t just for the rich. He says the cost of apartments is within reach for many middle-class Palestinians. But he also blames the Palestinian Authority for not helping him finance low-income housing. Over the past year, we’ve seen how Rawabi is slowly but surely taking shape. The project’s first phase is now almost complete, and nearly ready for residents to move in. But, at this late stage, the politics of property has thrown up another major hurdle – Rawabi doesn’t have water. All new water infrastructure larger than a pipe 2in (5cm) in diameter has to be approved by the Joint Israeli-Palestinian Water Committee. But the JWC hasn’t met for years. When we return to Rawabi at the end of 2014, even Masri’s trademark optimism is beginning to falter. Despite repeated promises from Israel that water will be provided “in a few weeks”, the JWC still hasn’t met. And both Israeli and Palestinian officials are dragging their feet. Masri suspects he’s become a bargaining chip – that Israel will only agree to Rawabi’s water if the Palestinians retrospectively approve water that’s already installed in Jewish settlements. That’s a deal the Palestinians won’t do. Col Grisha Yakubovich of the military body which administers Israel’s occupation in the West Bank, COGAT, is adamant that “there are no conditions”. “Water will come in days, or weeks,” he tells us. “When there’s an absence of a political process, what happens is that everything else becomes a casualty of that paralysis. There was a period of time when this went through the Joint Water Committee in a very non-political way,” he says. 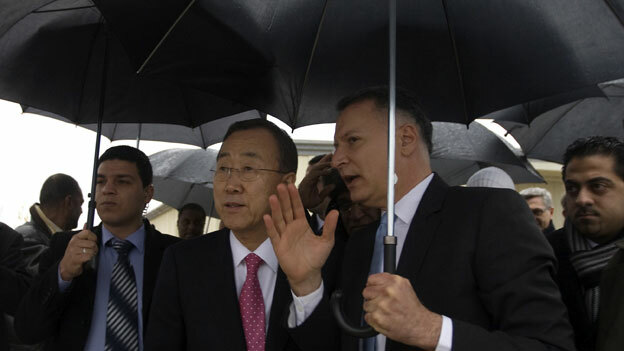 He’s raised the water issue with Israeli officials. “Even President Obama has raised it,” he adds, his voice rising with exasperation. 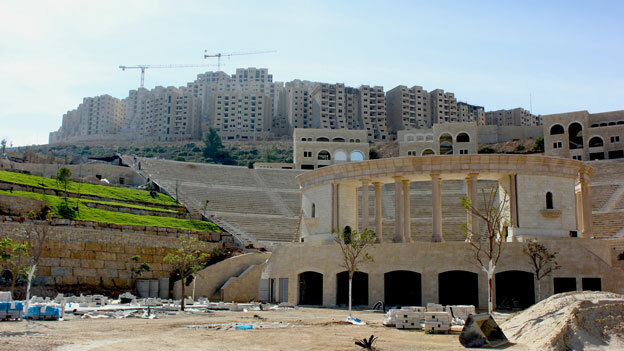 That’s because a lot more than one big building project rests on the fate of Rawabi. “It’s going to be a lot tougher for us to bring in investment from people outside of Palestine if one of the leading Palestinian businessmen can’t get his project to go ahead inside what would undoubtedly be a Palestinian state,” Blair explains. He’s responsible for overseeing a $4bn economic plan for Palestinian areas, announced last year as an effort to bolster a beleaguered peace process. As Rawabi’s water remains hostage to politics, its would-be residents are losing hope. 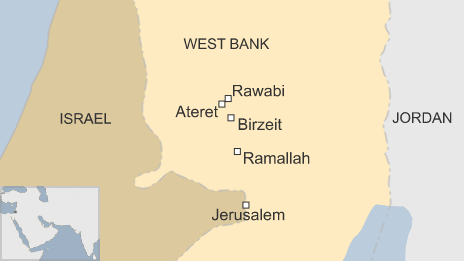 “If Rawabi fails, it’s a failure for the two-state solution. It’s a failure for the peace process”, argues Saeb Erekat, the chief Palestinian negotiator.